The "correct" pronunciation of vowels is always a difficult part of learning any new language. English vowels are pretty much localized in the oral cavity (mouth). This is different from many other languages, in which other factors such as nasalization (using the nose cavity) may be more involved. You can see below a chart of vowels taken from the International Phonetic Association, a group dedicated to standardization in the study of pronunciation of all spoken language. 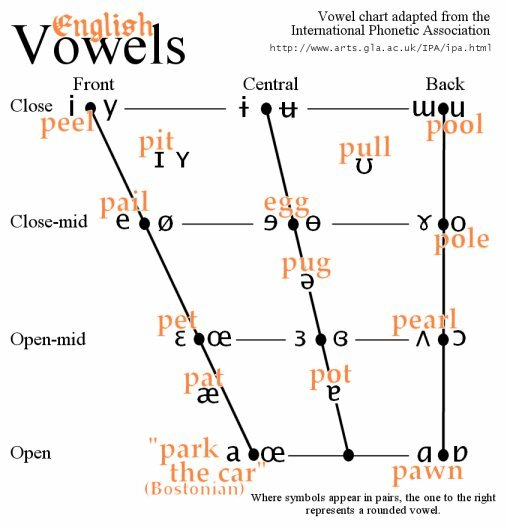 This chart has been modified a little to show where many English vowels can be found in the diagram. Some sample English words which use the sounds are shown in an "orangish" color. Please keep in mind that this chart reflects a limited, narrow idea of "correct" English pronunciation of vowels. Native English speakers in the United Kingdom would surely disagree with many of the samples given here, and there is even significant difference among speakers in the United States! The chart below reflects the a "typical" midwestern accent, with the exception shown, the "/a/" sound, which typlifies an East Coast accent pronunciation of a "soft" 'a'. You can click on the words to hear them, if your computer is equiped wth speakers or headphones. A repetition of the phoneme. Repeat what you hear to practice the phonemes. Try to identify vowel sounds that you seem to have trouble with, and concentrate on them. Note that the IPA vowel chart tries to show something about the mechanics of vowel pronunciation. This is related to the fact that the position of the tongue, the degree of openness of the mouth and position of the lips all contribute to the formation of distinctive (recognizable) vowel sounds. Where in the mouth does the vowel "resonate" (vibrate)? Is the mouth fully opened, almost closed or somewhere in between? Are the lips relatively relaxed or rounded? You might want to experiment with "feeling" the positions of your tongue, jaw, and lips as you try out the vowels given here. Ask yourself the questions shown above: Where in your mouth is the vowel vibrating? How does your tongue influence this? How open is your mouth as you speak the vowel? Finally, observe the position of your lips: Are they relaxed or rounded? Another thing you can do—and which directly relates to the factors descibed above—is play with "sliding" up and down (or along) one of the lines shown in the chart. For example, look at the picture of the playground slide on the left. The vowels "sliding" up and down this slide are all in the BACK of the mouth. The vowel sound at the top of the slide has the mouth (almost) closed, while the vowel at the bottom has the mouth opened. 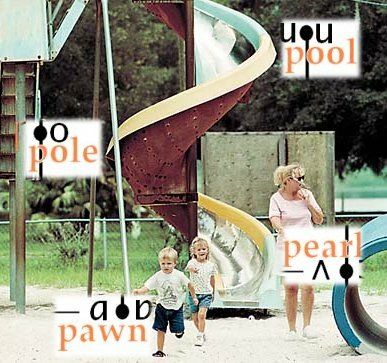 Starting with the "/u/" sound of "pool", slide down through the "/o/" sound of "pole", the "/ʌ/" sound of "pole", and finally to the "/ɑ/" sound of "pawn". As you do this, the sound should resonate (vibrate) in the back of the mouth, and your jaw should be sliding continuously from a closed position to an open one. 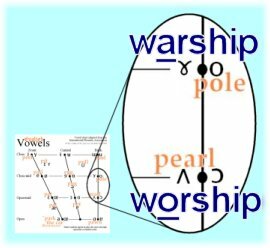 When you've reached the bottom of the slide, then "slide" back up from the "/ʌ/" sound of "pole", back to the "/u/" sound of "pool," being sure to visit "pearl" and "pole" along the way. Does all this sound silly to you? You bet it is! If you'd like to hear a grown man playing this weird little vowel game, click on the playground picture. Note, of course, that two things are changing, the openness of the mouth, and the roundness of the lips. Sometimes, the chart can help you visualize small differences between neighboring vowels. "Wash up! We're gonna worship the warship"
You can click on the picture to hear the words being spoken. 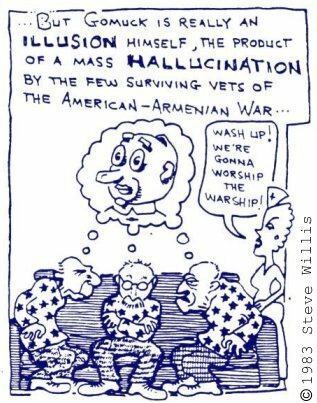 The mouth is slightly more open in worship than in warship. Listen to the sample and practice saying it. Try to notice the difference in the openness of the mouth between the two vowels.